This blog contains an excerpt of a remarkable story published in the magazine The Fix. It is the Story of how an approach developed in a Western culture – Narcotic Anonymous – to help people recover from narcotic addiction – has had remarkable success in another culture. ‘Rebecca had experience being in tough situations at 3 AM in the morning. In the thick of her heroin addiction, she had been in jeopardy countless times. As the Assistant Executive Director of the Narcotics Anonymous World Services Office, she had traveled all over the world. She had led workshops for emerging NA fellowships in many Third World countries. Still, nothing had prepared her for standing in line at customs at the Tehran Imam Khomeini International Airport in 2006. Standing next to NA Board Member Tom M. from Hawaii, Rebecca leaned on her old friend for reassurance. As a six-foot-tall blond woman with a poorly-tied impromptu veil, she knew she stood out; an American in the wrong place at the wrong time. Although Tom reassured her that everything would be all right, Rebecca kept thinking of the tabloid reports about Iran in the American media. She came of age during the Iranian hostage crisis. Night after night, the images of bound and blindfolded hostages on Ted Koppel’s Nightline had been downright terrifying. After passing through customs, Rebecca and Tom were greeted by Siamak, the office manager of NA World Services Iran, and several other enthusiastic Iranian NA members. She was surprised they had stayed up so late. After a quick bite to eat, they wondered if they could take a rest. Siamak let them know that wouldn’t be possible until later because there was so much to do and see. There were people to meet and things to accomplish. Most importantly, the fellowship had set up a Narcotics Anonymous meeting where they would share their stories through translators. 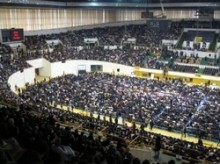 Over 24,000 Iranians in recovery greeted the NA World Services representatives in celebration. But it wasn’t Tom and Rebecca they were cheering; it was NA itself. Coming from the United States, they represented the birthplace of Narcotics Anonymous, a program that had saved so many lives and become such a force for good in Iran. All of Rebecca’s fears of going to a fundamentalist country as an American citizen evaporated as the tradition of Persian hospitality, the passionate belief of the Iranian NA members and a truly universal celebration of recovery became the zeitgeist of the moment. You must read the whole of this fascinating article.